Granite countertops are installed in countless kitchens around the world. While true granite, an igneous rock is actually pink to gray in color, there are many stones on the market known as "commercial granite." These stones sold as granite can be found in a wide range of colors of styles. From red and blue to black and gold, there are a variety of colors to choose from to suit many kitchen designs. Browns, tans, golds, yellows and creams can sometimes have a great deal of overlap in color. Some stones, such as Giallo Ornamentale, may be classified as "Yellow," "Gold" or "Cream," depending on the lot of the vein in the quarry the stone has come from. Some colors of granite that fall into these categories of color include Colonial Gold, Giallo Fiorito, Giallo Venezia, Gold Antique, Harvest Cream, Taupe Gold, Madurai Gold, Boreal, Brown Pearl, Merry Gold, Oxford Gold and Stormy Night. Depending on the dealer of the stone and how he classifies it, these stones may be found labeled as brown, yellow or beige. One of the most common colors in granite countertops is green. Ranging from very dark, nearly black, to extremely light and mixed with white, green granites are very common. Some colors that can be found easily include Costa Smerelda, Green Coast, Butterfly, Green Peacock, Uba Tuba, Earth Glitter, Golden Lightning, Jungle Green, Laurenatian Green, Green Marinache, Spring Green, Turtle Green and Wild West. Green granites range tremendously in price from inexpensive and starting at $30 a square foot, as of April 2011, to very expensive and costing hundreds of dollars a square foot. Nearly all green granites will contain yellow, white, black, turquoise or red mixed with the predominate green. Some of the more exotic granites can take on extremely bright and vivid tones, including purple, pink, blue and red. Pink granite is fairly common and is frequently found mixed with gray. Pink stones include Shivakashi, Ghibli and Lady Dream. Purple and red are less common but still widely available, with some stones being labeled both red and purple, depending on the exact color of the slab. Purple and red granites include Violetta, Labrador Antique, Paradisio, Cinnamon, Red Malibu and Fuoco. Blue granite is the most rare and most expensive stone on the market. Stones that are truly blue include Blue Bahia, Blue in the Night, Blue Eyes, Blue Fantasy, Typhoon Blue and Blue Macuba. 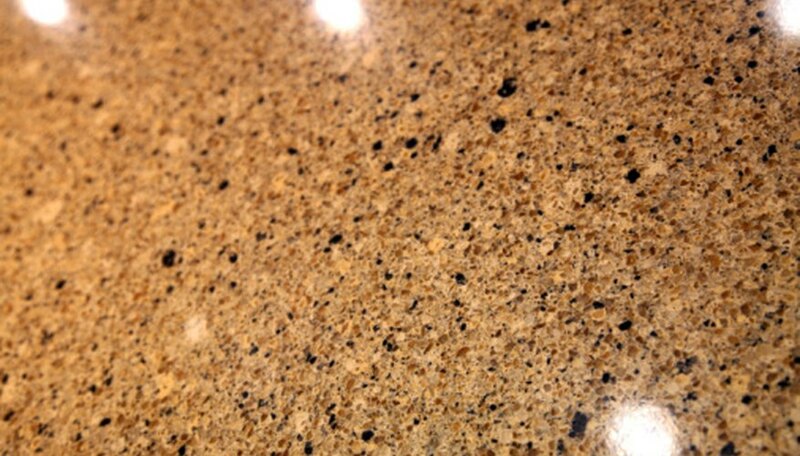 Granite counters do not have to contain large amounts of vivid color. Several stones are in fact in varying shades of black, white and gray. Few white granites exist, with many crossing into the gray category. These include Bianco Romano, Bianco Sardo and Piracema. Gray stones include Kinawa, Azul Platino, Cardasio, Pietra and Standstead Gray. Many gray stones frequently include browns, pinks and some white in the mix as well. Black granites can range from Absolute Black, which is flat black in color, to mica flecked Black Pearl and stones such as Black Galaxy and Black Marrinache, which include varying tones of gold, white and gray in their mix. What Are My Marbles Worth?